Why Would Anyone Rescue a Chicken? In early 2017, during my volunteer shift at the Wild Bird Fund in New York City, I met a hen who was suffering from severe and chronic reproductive illness, including a prolapsed uterus. I discovered that her ailments were common for hens bred to be laying hens. As I searched for someone willing to care for her special needs, I discovered a network of vegans (primarily women) who rescue and care for rescued chickens. I thought about how many women still struggle to obtain adequate, affordable reproductive health care - and how in turn we are socialized to exploit hens' reproductive systems. It seems that even across species, society expects to dictate how females use their bodies. I decided to make portraits of chickens and their rescuers to pay tribute both to the birds who have suffered so much and the people who have invested so much love, time and money caring for them. 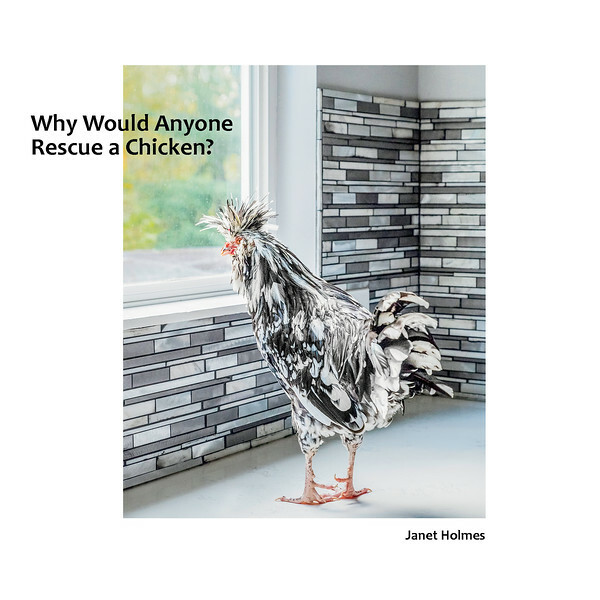 I've created a photo book to celebrate these individuals, to raise awareness about how chickens suffer in the egg industry, and to raise money to fund health care for rescued chickens. Why Would Anyone Rescue a Chicken? is available for purchase on Blurb.com.